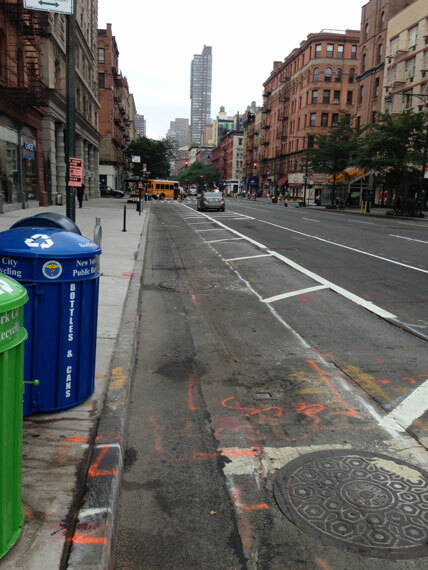 The Columbus Avenue protected bike lane won’t be a disconnected stub much longer. DOT is striping extensions of the bike lane south from 77th Street and north from 96th Street this summer, following a supportive vote from Manhattan Community Board 7 in February. Streetsblog publisher Mark Gorton sent in this shot looking south from 76th Street this morning. This project will basically link the Columbus Avenue bike lane with the Ninth Avenue bike lane, though the plan calls for sharrows instead of a protected bike lane between 69th Street and Broadway. More than 20 blocks of Columbus are in line for the substantial pedestrian safety benefits seen along the existing Columbus Avenue segment — a 41 percent drop in injuries, according to DOT. Neighborhood advocates fought long and hard to win this street safety improvement, repeatedly encountering resistance from the co-chairs of CB 7’s transportation committee. Next on the agenda for Upper West Side street safety: the transportation committee is meeting this Wednesday to discuss the future of other major avenues in the neighborhood. By the standards of streets in Queens, that would be considered good pavement. At least the manhole is flush with the pavement. This is truly exciting, and great progress! That said, DOT keeps leaving sharrow gaps, which are huge barriers to mobility via bicycle. If you’re not comfortable riding on Columbus normally, what makes DOT think that people will ride on Columbus with sharrows? Sharrows are not a substitute for protected bike lanes and do not effectively fill gaps between protected lanes. An 8-80 bike network is only created when every piece of infrastructure along that network is built for use by ages 8 to 80. The implementation on Columbus is like building two stretches of railroad without any tracks connecting them together. Sure each projects can move things along it, but you get exponentially more benefit when you link the facilities together into network. DOT keeps doing this, and it is a huge problem. There are sharrow gaps on 8th Ave (39-42) and 1st Ave (49-59), a gap in protection on 2nd Ave (23-14th), and a generally poor connection between protected lanes on 2nd Ave & Allen St. Fixing these would make the network MUCH more connected and useful to users of all ages. Funny that was my reaction too. Riding the upper stretch near 110th St on Saturday, I was proud to see how the neighborhood drivers had accepted the new regime: The striping wasn’t quite finished and no green paint had hit the bike lanes. But the parked cars were already where they belong, forming a protective barrier between the bike space and the traffic lanes on the avenue. And the pavement’s smooth too, not wavy like Queens Blvd. Always a good test to my shocks: car or bike. In other news, the first paint for the 59th Street Bridge improvements on First Avenue have gone down. I’ve been waiting for this for years. There were almost no bicyclists along that route currently because it literally went nowhere. Can’t wait to see how many bicyclists (myself included), turn this into their daily commute! No more detours through central park or Hudson River. why can’t they do this to 5th and 6th avenue from 59th street and down? I live near 84th and Columbus. I want to know how far the enclosed bike lane goes in a southerly direction down Columbus Ave. I need to get from 84th and Columbus to 57th and Broadway and then return to 84th and Columbus. Any suggestions? I am almost 70 and I cannot spend another year recuperating from an injury. I want to ride to and from my bridge club. I will not ride Central Park West bike lanes because it is not enclosed. Have occasionally taken the Central Park West parkside sidewalk. Believe me, I am not a hotshot rider. I do stop if children are near by. Go to the Community Board meeting– Transportation Alternatives is advocating creating a protected lane on Amsterdam Avenue for those who want to go back uptown more safely than in the (in my experience frequently blocked) uptown lane on Central Park West, but there is some resistance. I too would love to be able to ride on the CPW sidewalk (carefully) but since we are not allowed to do that a protected bike lane on Amsterdam is essential.